Full leather gloves with steel shot tightly packed into the knuckle area. Really makes a punch more effective and protects your hand. 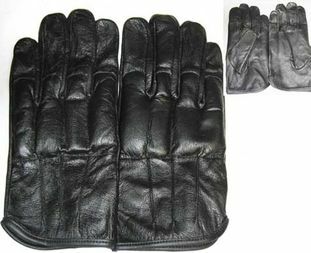 These are all leather goatskin with longer ends for wrist protection. With your hand flat, measure around your knuckles-do not include your thumb, if more than 7.75 inches and less than 9 inches, Large is the correct size.